Multiple Testimonials. Used in USA and Europe. Please call 513-772-0404 to discuss your specific application or to request a quote. View in MHI Store for price and dlivery of a standard model. HotTops™ are intense heaters that offer radiative, convective, plasma, and combination heat sources for energy delivery. 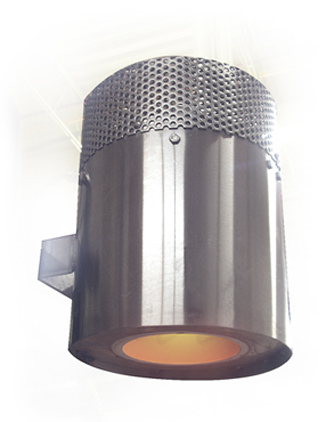 Compared to IR heaters, HotTops™ are more intense, more robust and offer higher temperatures. The HotTops™ (hot top heater) can also be configured to complex shapes whereas IR heaters are necessarily straight. HotTops™ may be controlled over a range of temperatures and powers adding versatility. HotTops™ are generally used upside down (1900°C nside heater elemnt configuration), sideways, or with Airtorch™ configuration. For down side up heating see Thermoplate. Multiple HotTops™ can be controlled by MHI Multi Zone Electronics. Please email us or call (513) 772-0404. FiberFree Refractory™. Amazing thermal cracking reistance.